TODAY marks the anniversary of a momentous event: the reversal of Iraq’s aggression against Kuwait from August 2, 1990 to February 28, 1991. 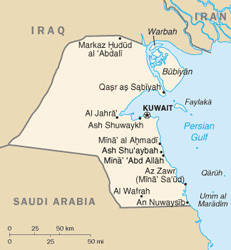 For Kuwaitis, the citizenry of their fellow GCC members, and people from many other countries, including the United States and other Allied Coalition members, the multifaceted damage inflicted by Iraq in the course of its invasion and occupation of Kuwait unleashed changes from which the world has yet to fully recover. The most comprehensive and rigorously applied international and political sanctions against any country in the last century, and the impact of the sanctions’ applicability and enforcement, remain a source of ongoing controversy in terms of their differing impact on Iraqis and Kuwaitis. Even now, two decades later, important postwar facets of what Iraq did to Kuwait remain elusive of closure. Certainly, the international legal dictum of an aggressor providing prompt, adequate, and effective compensation for the war’s victims has yet to be honored. A full accounting of the fate of all of the Kuwaiti and other countries’ missing citizens — swept up and carted off to Iraq in the war’s waning hours — remains incomplete. At a recent gathering of diplomats, scholars, media representatives, and individuals who fought to liberate Kuwait and American armed forces’ civil affairs personnel who participated in the country’s reconstruction at George Washington University’s Elliott School of International Affairs, it was noted that more than 500 of the missing Kuwaitis have died since their capture, but the fate of more than 200 of those missing remains unknown. The more than 700 Kuwaitis who were and remain missing may seem small to some. However, they are more than 700 too many if viewed from the perspective of the victims and their loved ones who continue to await and pray for their return. What’s so often lacking in most accounts of Kuwait’s MIAs is context and perspective. It’s this: the number of Kuwaitis and others who are missing — a tenth of a percent of all the Kuwaitis — can be compared to the number of Americans missing when the U.S. population in 1991 was 270 million. From this perspective, the analogical equivalent would be 270,000 Americans having been carted across the border to Canada or Mexico, where to this day they would remain missing and unaccounted for. It is the same as if 50,000 Frenchmen or British citizens had been taken prisoner by an invading army, spirited away, and were being held hostage, perhaps as a bargaining chip in some future negotiations or as the invading and occupying forces’ final act of brutality, by the armed forces of a neighboring country. Most Kuwaitis of my acquaintance know at least four of those who are missing. Most also know at least forty of their friends and relatives left behind who long for the hostages’ repatriation. The cost and losses in terms of health and human life, in jobs, in dreams trampled, in material well-being among the invaded — and, subsequently also by the citizenry in the land of the invader as a consequence of the invasion and the ensuing sanctions — may never be known. Even the conservative estimates of economists who estimate the extent of the damage to be in the hundreds of billions of dollars, look like typographical errors. Would that they were. Against any measurement of the devastation visited upon the human victims that ensued from Iraq’s invasion and occupation of Kuwait, one is perhaps still too close to the act itself to venture another kind of calculation. But, a rational, detached assessment may one day be possible. When that day comes, the tally will have to take into account what was achieved as a result of the GCC-U.S. geopolitical, defense, and economic relationships as the crisis unfolded. Here, for once, each and every one of the criteria for membership in the United Nations — a country must be able to demonstrate that it is nationally sovereign, politically independent, and its territory is intact — which were smashed to smithereens by the Iraqi invasion and occupation of this small and defenseless country — were restored, international law was upheld, and the Kuwaiti people regained their safety and freedom. The Gulf Cooperation Council’s (GCC) six member-countries — Bahrain, Kuwait, Oman, Qatar, Saudi Arabia, and the United Arab Emirates — played vital roles in the aggression’s reversal. They were center stage in replacing the 4.5 million barrels a day of Iraqi and Kuwait oil that were declared off limits by the United Nations Security Council within twenty-four hours after the invasion. The GCC countries were pivotal players, also within 24 hours of the invasion, in persuading a majority of the then 22-member Arab League countries not only to condemn the invasion. In addition, exactly a week later they succeeded in convincing a majority of the members again to endorse the mobilization and deployment of Arab armies to Saudi Arabia to prevent the invasion from spreading beyond Kuwait. And they took in hundreds of thousands of Kuwaitis who managed to flee the carnage inflicted upon their country. 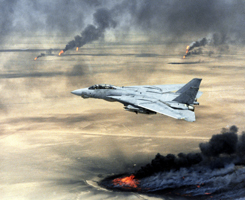 US Navy F-14A Tomcat in flight over burning Kuwaiti oil wells during Operation Desert Storm. Further, the GCC countries, with Saudi Arabia in the lead, took in more than half a million American and other countries’ foreign armed forces personnel that came to liberate Kuwait. In short, the GCC-U.S. relationship was the cornerstone of the internationally concerted action that succeeded in reversing Iraq’s aggression against Kuwait. In tandem with American diplomatic efforts, the GCC countries helped ensure majority UN Security Council votes aimed at ensuring that Iraq’s actions would be defeated. In so doing, they helped prevent Iraq from expanding its invasion to the other GCC countries. The international alliance, of which the GCC countries were the most prominent Arab component, not only liberated Kuwait. It re-instated the country’s internationally recognized legitimate government. It restored freedom and security to the Kuwaiti people. The GCC countries were second to none in replacing the substantial amounts of energy lost during the course of the invasion and occupation. In the process, they helped calm international anxieties related to oil production and pricing whilst protecting the vital source of energy that fuels the engine of global economic growth. But this was not all. The alliance persuaded the world’s highest political body, the UN Security Council, to do what neither it nor any other institution had ever done before, or since: guarantee the border between two countries, i.e., Kuwait and Iraq. Even now, the border remains the only one in the world which the UN member countries are legally bound to uphold. And, not least, the coalition highlighted the need to strengthen The Hague and Geneva Conventions regarding the laws of war. It did so with a view to providing more effective mechanisms to prevent a recurrence of what, following in the wake of Iraq’s act of war, were some of the most egregious acts imaginable committed by one country against another country’s people, its society, economy, institutions, and its environment and natural resources. Notwithstanding ongoing debate about other aspects of the crisis and conflict, a glance in the rear view mirror will reveal that these and other achievements are of no small moment in the annals of U.S.-GCC and U.S.-other Arab strategic, economic, political, and related ties. Certainly they were without precedence at the time in the history of Allied cooperation in defense of a region that, then as now, is vital to the world’s economy and, as such, of overriding importance not just to its inhabitants but to all of humankind. This entry was posted in 1990-1991 Gulf War, John Duke Anthony, Kuwait.